When we arrived at Foz de Iguazu, Debbie and I took a taxi from the airport to the falls. She caught the park bus up to the start of the walk way, and began the climb down the path, with fresh vistas of the falls at every turn. Having been to the falls once before, I waited at the entrance of the park. 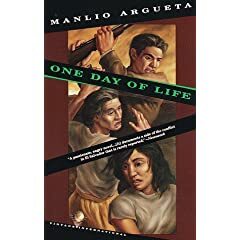 I ordered café com leite and sat at one of the plastic tables - bags and rucksacks surrounding me - and began Manlio Argueta's One Day of Life. To be absolutely honest, I had begun to read it once before, on Ipanema beach. But beach volleyball and icecream sellers don't fit so well with a tale of torture and violence. But then, what does? Manlio Argueta is a Salvadorean writer, exiled in the early 1970s for his writing and political activity to Costa Rica. He has now returned to Salvador and is Director of Art and Culture at the University of El Salvador. The political tensions that surround my work have to do with my affinities concerning the rescue of historical memory. As such, they deal with the special circumstances of the prewar period that for me begins in 1932 and lasts until 1980; and later, to the references to the crisis of war (1972–92)...Well, I wrote One Day of Life before the civil war was declared (1981–92). I read the book quickly, scanning the pages, and with one hand around my café for comfort. One day is how long I spent in El Salvador but in Lupe's voice I heard again the voices of friends and strangers who had described the trauma and loss of El Salvador, Guatemala and other Central American countries. The climax of the story is the encounter between Lupe and her husband José, witnessed by her granddaughter and the soliders who bring José, tortured and unrecognizable to his grandchild, to their home. Lupe summons all her strength to deny José. In contrast to the passion narrative in which Peter's denial appears as an act of rejection that haunts him, Lupe's denial is an act of courage and an expression of love. In poetry, in memory, in silence and in denial, there are acts of love. available at Amazon UK here. A common observation raised by some critics is of your particular use of Salvadoran vernacular. Rather than noting how the Spanish language has many regionalisms throughout Latin America––indeed, is Salvadoran speech any different than the other transformations Spanish has undergone throughout the Americas?––the mere "distinctiveness" of Salvadoran speech is posed through a binary of inferior and superior cultures and languages. It seems as though the significance of your literary enterprises gets fairly diminished. Can one say that your books are not only in solidarity with the struggles and everyday speech habits of the poor, but also with linguistic practices by other authors that displace colonial tongues? I am thinking of writers like Nigeria’s Chinua Achebe, India’s Salman Rushdie, and Gloria Anzaldúa, a Chicana. Thanks for sharing these questions with us. I hate the way the political interest of the western world 'moves on' from such national disasters and am sure that it is the job of artists to hold some of the memories and enable us all to reflect more deeply.